Luna: the ever-wondrous luminous being that we call our “moon.” This enigmatic and scientifically inexplicable planetary specimen has baffled humanity and scientists for thousands of years, (if not hundreds of thousands of years). Yet, the moon also draws us in, and talking about energy of the moon is undeniable; an energy it almost seems to teasingly hold over our awareness, taunting us to search for meaning from its inescapable pull. The moon undoubtedly has a powerful energy; it is one that not only attracts our attention, but is also the most important planet in our solar system, since it gives the Earth life. It creates our currents and maintains the oceans’ tides – the Earth would probably not be able to sustain life without it. Everything in the Universe is made of energy and emits frequencies – including our physical bodies and the planetary bodies. As the moon goes through it’s monthly cycle, (or lunar cycle), she gives off different energy during each phase. For example, the vibrational energy she gives off during a new moon, is completely different from its polar opposite phase, the full moon. Reminder: as with any universal energy or universal law, you must be in a positive and mindful state to harness lunar energy to its fullest potential. We should always aim to do this, anyhow! Whatever is going on in your body, mind and spirit will be amplified during any particular moon phase. You must always be conscious of the fact that, yes, you will feel the moon’s effects on your mind and body… but your subconscious is also affected behind the scenes. During any moon phase, the first and foremost habit you should get into is creating a twice-monthly ritual for yourself, which helps you to stay mindful of your personal bi-monthly goals. By getting into a routine, you keep your focus on what those goals, enabling them to manifest faster. During the new moon phase, the dark side is facing Earth. The energy showered upon us is all about renewal, as even the moon itself is entering a new 28-day cycle. It is dark, and metaphorically, we are dealing with an energy of the unknown. The last cycle is gone and for that one day, the new has yet to come. This uncertainty is exciting. This is a time I like to consider a “blank scroll,” for which to cast your dreams, visions, and affirmations out to the Universe. Remember, thoughts are also vibrational frequencies, and are very powerful when you send them out to the collective consciousness. This is a time to manifest, to create, and be very mindful of what it is you desire in life. The best ways to capture the new moon energy is through ritual. A new moon ritual can be anything you are comfortable with, such as: absorbing the lunar energy outside, or getting together with others to keep high vibrational energy around. You can also utilize crystal healing and therapy, since gemstones are also living beings that radiate and absorb frequencies. What helps the most is meditating on your goals, and most importantly, writing those goals down. By writing your thoughts down, it seems to double in energy. You have now had a thought, written it down, visually acknowledged the words, and read it back in your mind as you write. On the other hand, during the full moon, the entire bright side of the moon is facing Earth. The moon illuminates everything in our lives, and forces us to shine the light on that which has passed, and consider how we can grow and improve our existence. 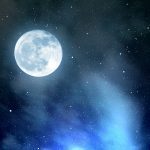 The full moon is a time for release – it is a time to contemplate our lives and what it is that should be shed. This is the best time of the lunar cycle to let go of all that does not serve you. It is a time to cleanse your mind, body and soul, as the energies of a full moon are extremely potent. Think about the tales of the full moon – how more babies are born on that day, animals seem to act in a peculiar way, and even the ocean swells from the vibrational energy emitted. This is no coincidence. A full moon brings an influx of spiritual energy upon us, and enables us to focus on transformation. If we are not ready or open to receiving this energy, (and accepting it), it can sort of throw us for a loop…. just like the animals. It is a time to think about how we can transform and improve ourselves, our health, our bodies, our mind, and most importantly, our spirituality and soul essence. Some helpful rituals during the full moon include: moon gazing to absorb the energy fully, keeping your hair down while you sleep to absorb it through our “antennae,” meditate (and practice self-forgiveness for that which you need to release), cleanse your crystals to clear their energy, keep your emotions in a state of acceptance, and write down what it is you want to release then burn the paper. Also, write down what it is you are grateful for, to remind your subconscious there is good in your life, and releasing is helpful and healthy. And, most importantly…. in all ways imaginable… just let go.